Paschal Donohoe’s 2018 Budget proved to be as expected. Mr. Donohoe announced some €1.2 billion in new spending and tax cuts, split on roughly a 2:1 basis in favour of spending. A much-leaked budget, with few surprises, the main revenue generator for Budget 2018 is a hike in stamp duty for commercial property transactions from 2% to 6% which is expected to generate revenue of €376 million per annum. A restriction to intangible asset relief could adversely impact Ireland’s FDI offering, however, changes to the nation’s corporation tax could have been much worse considering the pressure applied to Ireland by the European Commission, the USA, and OECD. Brexit concerns for Irish businesses were not adequately addressed in the Minister’s speech. 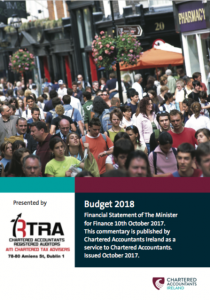 While financial assistance for the SME and Agri-food sectors are positive, it’s disappointing that upfront VAT charges, that may apply when the UK leaves the EU, were not mentioned in today’s speech and Chartered Accountants Ireland calls for this to be reconsidered at Finance Bill stage. Budget 2018 makes steady progress in reducing high rates of tax for low and middle-income earners. The changes to the income tax rate band: moving from €33,800 to €34,550 for single individuals, is a positive step. This demographic faced a sharp income tax hike on moving from the 20% rate band to the 40% rate band. However, it’s disappointing that the self-employed taxpayer still doesn’t enjoy the same tax credits as employees. The Earned Income Credit and the Home Carer Credit will be increased and a new BIK system for electric vehicles will be introduced. The Budget documents also give us insight into the PAYE Modernisation project and steps for merging PRSI and USC. Corporation Tax is a politically sensitive issue for Ireland. The European Commission and the OECD, and the Government is tasked with dealing with international initiatives in the spirit of being good international tax citizens. Today’s measures mainly introduce a restriction to intangible asset relief. There was a further announcement of a consultation on transfer pricing standards. A significant increase in commercial stamp duty, a commitment to build an additional 4,000 new social homes in 2018 and a reduced holding period for capital gains tax exemption were some of the key announcements in today’s Budget. The Minister allocated €1.83 billion into housing sector for next year. In order to make it easier for developers to access funds and build homes. A new agency called Home Building Finance Ireland is being established to leverage the skills and expertise of NAMA. There were no enhancements to entrepreneurs’ relief and no increases in any of the tax-free thresholds for capital acquisitions tax. Capital taxes were relatively untouched in the Budget, apart from some small tweaks. VAT remained relatively untouched though a special scheme is finally to be introduced for the charities sector. The tax on sugar-sweetened drinks (SSD) will see an increase in the price of certain soft drinks and similar beverages. A tax of either 20c or 30c per litre on drinks with a sugar content beginning at over 5 grams per 100 millilitres will be introduced from April 2018. Brexit concerns were alluded to in many parts of the Budget speech. The Minister was very clear in stating that Brexit will likely result in permanent changes in trading activities and patterns for Irish businesses. Chartered Accountants Ireland had called for a change to VAT import rules to deal with the upfront VAT costs that traders will face on imports from the UK under the current system which will cause cash flow problems when the UK leaves the EU and are disappointed not to see these mentioned.